When it comes to orthotics, Sutherland patients may get prefabricated or customised shoe innersoles for their specific needs. The podiatrist designs these innersoles to manage injuries and enhance biomechanics of the lower limbs. To create the custom-made innersoles, the podiatrist will take a cast of your foot. Alterations will be made to get the proper fit for your footwear. The innersoles will support, correct, or offload the weight on your injury. These shoe innersoles come in different types to address the specific needs of the patient. Adjusted to suit your footwear, these offer relief for work, leisure, and sport. Orthotics may be rigid, firm, flexible or soft depending on their purpose. If you have had orthotics in the past that have been ‘too hard’ then they probably were! It is simple to adjust them, so don’t dismiss them if this has happened to you. Often times finding good Orthotics in the Sutherland shire can be difficult, but it doesn’t have to be. The best is readily available to meet your Orthotics needs in comfort and with the most up-to-date procedures available. 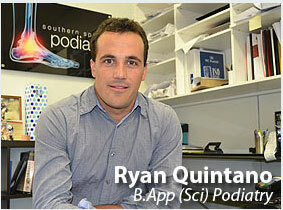 There is no orthotics specialist in the Sutherland Shire more capable of handling your Podiatry needs than Ryan at Southern sports Podiatry. The consultation is easy and it doesn’t take long. This Sutherland Shire podiatrist focuses on excellence. He will not rest until he is gotten to the bottom of the underlying condition causing you pain, injury or distress. The fact is that many times injuries go untreated because they are just Band-Aided with a common solution when the problem was far more complex than first thought. This is not what you need, especially if you’re an athlete looking for orthotics in the Sutherland Shire.